The weight of the book in my hand and its general quality were enough to tell me I was about to read something different, even had the author’s name not been enough. 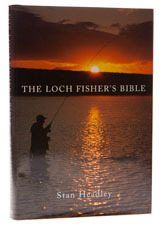 Stan needs no introduction, as he has been fishing the lochs for many decades and few are as well qualified as he to write the authoritative work on the subject. In the introduction, the point is made that this is the first comprehensive commentary on the lochs and loch fishing of Scotland since Bridgett’s book saw the light of day and reluctant though I usually am to let sweeping statements past, Stan has good cause for his claim. I have two comments to make about this book. The first is that I can’t think of a better one for beginner and intermediate loch fishers to read; it is surely destined to become a standard work. The second is that it is the first such text I have read in years that has been written by an author who gives sensible advice based on experience, rather than current fashion – take the statement, ‘It is often difficult to reconcile oneself to the argument that trout fly trends tend to reflect human choice rather than that of fish, but the evidence is strong’ and you have the flavour of what the Bible is about. No flights of fancy here, no unsubtle promotion of sponsors’ kit, just three hundred pages of good, solid advice. Forty quid well spent if Scotland is on your visiting list; read it and you will catch fish. The hardback edition is out of print, but Hale were offering a paperback for £16.99 in 2011.